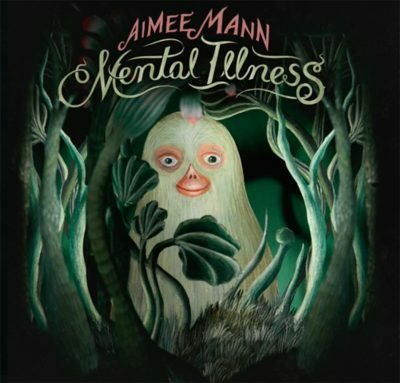 How nice and refreshing it is to hear from Aimee Mann, the solo artist, again. Aside from some memorably random tracks (such as her grand cover of the Carpenters’ “Yesterday Once More” from HBO’s Vinyl soundtrack are her illuminating “Can’t You Tell” from the politically charged 30 Days/30 Songs project) not to mention a cool side project with Ted Leo (The Both), Mental Illness is Mann’s first return to a proper solo album in five years, following 2012’s mini gem Charmer. Ever aware of her own image of writing depressing music—and often poking fun at that—the album title appears as a bold statement, if not also a pun. Fortunately, an artist of such an edifying back catalog takes her craft seriously, and the results here are illuminating and at times dizzyingly startling. Lead single “Goose Snow Cone” sets a tonal balance between the beauty of a decidedly acoustic-based sound and a lushly orchestrated one. Seemingly simple arrangements eventually reveal a delicate intricacy matched by clever lyrics and somber vocals. Subtle yet smart, witty yet wise, Mann the lyricist remains indispensable in describing the human condition. The varying characters Mann assumes in these tunes—both male and female in various stages of therapy—run the gamut of the desperate (“Stuck In The Past”) to the self-depreciating (“You Never Loved Me”) to the co-dependent (“Lies Of Summer”), yet what sets these songs apart is an astute dichotomy between melody and accessibility. As she successfully achieved in her masterful @#%&*! Smilers album, there is an interesting contrast within certain songs’ narration and a U.S. city: Seattle in the chilling plea “Knock It Off,” Houston in the waltz-like “Stuck In The Past,” Louisville in the breezy “Lies Of Summer” and, arguably, Philadelphia in the wondrously catchy tour de force, “Philly Sinks.” “It’s always locusts, or floods, or drought,” Mann clearly intones, “and then it’s parties or prayer / he picks a girl he can live without / And puts her down over there” before its clever chorus drops. Equally matched in memorability and craftsmanship is “Simple Fix,” which further boasts some gorgeous backing vocals. A nod to the fictional Carmen Sternwood (Chandler’s The Big Sleep) in the Hollywood-esque “Patient Zero” further demonstrates these strengths. Working again with her longtime producer Paul Bryan (Smilers, Charmer), Mann is surrounded by talented musicians, including Jonathan Coulton (acoustic guitar) and Jamie Edwards (piano), and even some background vocals from her Both co-conspirator, Leo. There is a dreamy, sing-along quality to these tunes, and that’s what sticks in the brain. Ultimately cathartic and fascinating, these 11 songs cycle through one’s brain and fit distinctively into Mann’s heterogeneous oeuvre.